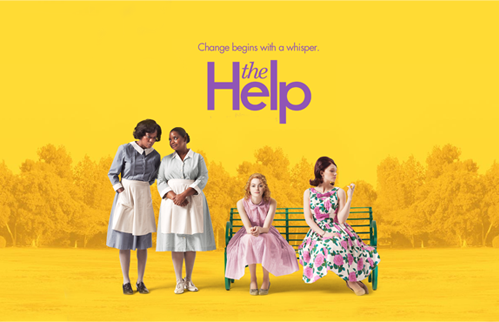 I finally got around to watching 'The Help' last night, a movie based on the bestselling novel by Kathryn Stockett. Nominated for four Oscars (Best Picture, Best Leading Actress and two Best Supporting Actress nominations), it was no surprise that this was an outstanding film. Middle aged black maid Aibeleen Clark (Viola Davis) has been raising white children in Mississippi for most of her life. When approached by upcoming writer Skeeter (Emma Stone), who has just returned from college and is interested in writing a piece from the Black maid's perspective, she is reluctant due to the rules black people must abide by during the early 1960s. But when Aibeleen witnesses the poor treatment of her friend Minny Jackson (Octavia Spencer) and a spark of courage during church, she decides to speak out and tell her story, and so does Minny. The pain, the trials and the injustice are heartbreaking but Skeeter is determined to publish the truth and hope for change. However, as the civil rights movement reaches a peak and violence begins to erupt, the three are endangered and question whether to continue or not. I found myself completely engaged with the story and the flow of the film was perfect. I was not bored at anytime and was invested at the cause, the culture and the lives at the time. At over two hours long, the movie fills you with laughter, emotion and hope. The strength of the movie undoubtedly lies with the phenomenal cast, each person brings their own character to life and their subtle differences create a diverse web of relationships, exploring values and truths. Also stars Ahna O'Reilly, Allison Janney and Mike Vogel. Viola Davis was phenomenal in the movie and deserved her Oscar nomination, bringing humour and great deep emotion to the role, but Octavia Spencer (who won the Oscar for best supporting actress) was truly sensational, bringing a subtle yet dramatic performance we couldn't forget- one full of sass and personality. The different personalities of the white females played by Emma Stone, Jessica Chastain, Bryce Dallas Howard and Ahna O'Reilly create an interesting dynamic and all had very likeable performances with amazing chemistry. Overall, 'The Help' was a beautiful film which was more enjoyable than you'd expect. Filled with humour (probably more laughs here than some bad comedy) as well as emotion, this is a wonderfully moving story filled with hope. With a phenomenal cast which brings the whole movie together with great character, there's no surprise it received three Oscar nominations for cast. Fantastic movie for the family.